Hi, my name is Mati Davis. I am18 years old and have come to Israel from Los Angeles, CA. I decided to take a gap year because I feel that I need time to think about my future and connect with my family living in the land. I chose Aardvark because of its versatility and diversity of opportunities. I am currently living in the neighborhood of Katamon of Jerusalem. It’s a very lively neighborhood; many yeshivas and seminaries are just a few minutes walk away. The center of the city (Ben Yehuda, Mamilla, and the shuk) is a 20-minute bus ride from our apartments. Coming from LA, the heat is bearable although I am very excited for winter, and hopefully some snow! Still, It’s been great getting to know the city (mostly by getting lost due to the hectic bus system) and exploring the little-known nooks, which contain some of the best places (I recently discovered an excellent tea shop in an alley off of Ben Yehuda). I am currently participating in Selah as well as interning at the Skirball Center for Biblical Archeology. In Selah, I have taken a wide variety of Judaic classes ranging from Tanach for Life, in which we explore the subtleties of the Bible, to Super Holy Super Fun Shabbat, where we discuss unusual ways to connect to Shabbat. Selah has been very engaging and fascinating. For the past month, the staff and I have been searching for internship opportunities at various museums throughout Jeruslaem. This past Monday, I finally started my internship at the Skirball Center in which I locate missing pieces of ancient Tel Dan pottery within their storerooms. It is very hard but rewarding work. I am expecting to hear from the Bible Lands Museum and the Siebenberg House soon and I may intern at one of those places. I have always been interested in history, but have never found a good outlet for that passion until now. I have found that Jeruslaem is “the place to be” when it comes to archeology. The amount of museums within Jerusalem is staggering and I hope that throughout the year I am able to visit them all. I, along with my fellow Aardvarkians, attend academic classes in the afternoon. The class I enjoy the most is, obviously, a history class called Eternal Jerusalem. In the class, we learn about the history of Jerusalem through the Bible and the Bible through the history of Jerusalem. Recently, we studied King Hezekiah and the elements of a strong leader. I am also attending 2 other classes called The Art of Reading and Writing as well as an Arab-Israeli conflict class. In addition to academic classes, I am enrolled in Ulpan section ב+. 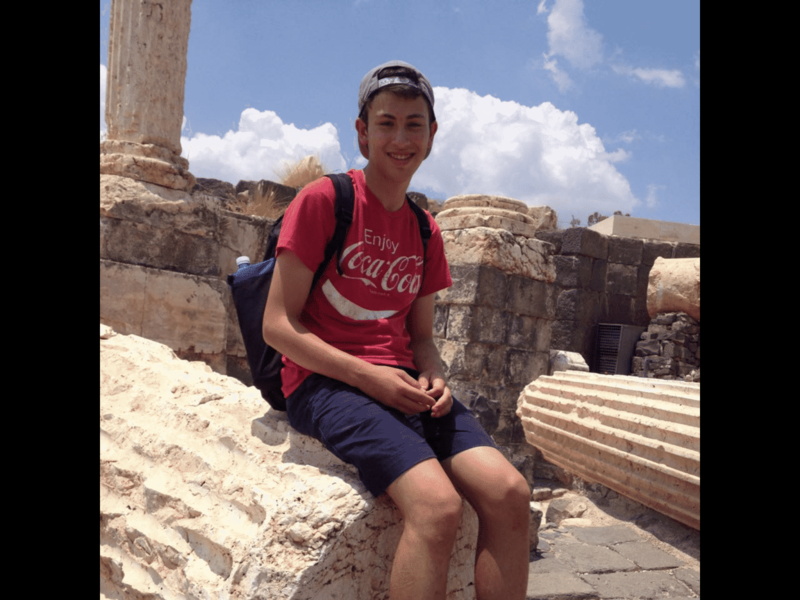 I have really enjoyed Ulpan and getting to know the language of my heritage. Last class, we deepened our Hebrew skills by watching the Israeli film, Zero Motivation. After dismissed from classes, many of us go to the city center to engage with the local nightlife while some of us, myself included, stay in the apartments and entertain ourselves. Though I have only been here for a month, I already feel at home, partly because I know Israel is my home and I am excited about what the rest of the year has to offer.